Oil press machines for house use are giving an opportunity to produce clean organic oil at your own kitchen. The popularity of healthy eating has led to emergence of different types of home oil press machines: there are handy manual devices and appliances with an electrical drive. Trying to answer the needs of our customers, our project brought RawMid Oil Press Machines with excellent features, perfect for raw foodists and healthy food fans. In this section you will find simple oil expellers with manual drive and a more massive press machines with an electric motor. Oil from seeds and nuts can’t be pressed at room temperature, but it is still possible to retain the valuable nutrients therein without destroying their structure. RawMID Oil Press allows oil producing with minimal heating (30-50 C). This type of extraction is called “cold pressure”: cold-pressed oils are the most healthy and valuable, and many kinds of them are hard to find on the market. Sturdy construction, materials are strong and long lasting. Optimized cold pressure technology – high efficiency. Universal machine, works with any seeds and nuts, where the oil content exceeds 25%. Safety – 100% homemade oil is 100% safe; oil expellers don’t require special skills to use properly. Reasonable price – cheaper than other brands. Manual drive oil expellers are suitable for small families and individual use. They are simply designed and power supply independent, have a lightweight body and affordable price (though, they will require some physical effort to work). In addition to cooking, produced oils can be used for beauty and health care. Electric driven oil pressure machines are able to process more foods without much effort, can be used for commercial purposes, like creating homemade oils, soaps, cosmetics and remedies. Electric press machines require more space and bigger money investment, but they definitely are worth it! Dream Oil Press: Who Should Buy? Individuals practicing a healthy lifestyle. Families seeking to restrict the use of low-quality oils in cooking. Those who make their own organic goods for sale. 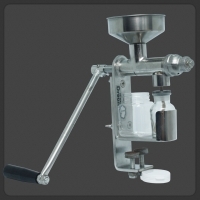 Buy Oil Press Machines at RawMID store – It's easy, fast and secure. For the past several years, our company brings the lowest prices on the market! Read detailed product reviews, choose a preferred method of payment and delivery! Dream Manual Oil Expeller is a perfect tool that will help you eat more healthy: it is simple, handy, efficient, and, most importantly, allows you to add high-quality virgin oil to your diet. For anyone who wants to gain more independence from the modern food industry, or just try producing oil w..
Dream Modern Oil Pressure Machine was specially made for home use. 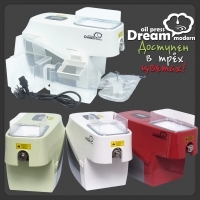 It is a smart choice for those who want to produce natural, eco-friendly products from oily seeds and nuts. With features like gentle cold-pressure technology, high efficiency and low power consumption you really will get the best..